I've had a long break from gouache, as you can see, but wanted to get in one painting at least during November! This one is a familiar place and time, as I revisited a photo taken last year. 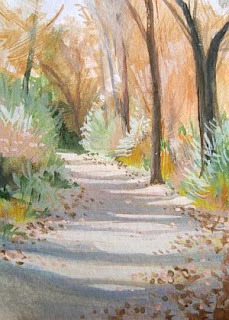 It's a trail we love to walk along the Rio Grande in the bosque (woods) that spread out alongside. Fall is a spectacular time to be there. I'm particularly pleased with the way the smattering of leaves along the dry, dusty path worked out in this one. I hope you like it, too.